Look on any supermarket’s shelves these days and you’ll see a huge variety of fruit juices, far more than were ever seen in our parents’ day. Orange juice (or occasionally grapefruit, apple or tomato juice) was the juice that typically appeared on most American breakfast tables. Now, it is possible to get juices in all manner of combinations, including such exotic fruits as mango, guava, pomegranate, goji berry and more. And although many of these juices have a healthy serving of vitamins and minerals, they also may have their fair share of calories and sugar. So is fruit juice good for us or not? Following are some of the pros and cons of drinking fruit juice. Easy way to get fruit – One 4-ounce glass of fruit juice counts for one full serving of fruit, so if you are too rushed to eat an apple you can down some juice. While fruit juice does not contain the fiber that makes eating the whole fruit so healthy, it is still better than getting no fruit at all. Good source of vitamins and antioxidants – One glass of orange or grapefruit juice can supply more than your daily requirement of vitamin C, boosting your immune system and providing you with free-radical-fighting antioxidants. It is also an excellent source of folic acid (which prevents birth defects and is good for heart health) and potassium (which helps to regulate blood pressure). High in calories – Pam Birkenfeld, as pediatric nutritionist at New York’s Nassau University Medical Center says, “Parents tend to think that because fruit juice is fat-free and comes from nature, it’s OK. But what they often don’t realize is that it is a very concentrated source of calories that generally does not fill you up, just out.” There is an average of 140 calories in an 8-ounce glass of fruit juice. If you consume a few glasses each day, those calories can add up. In contrast, an orange has only about 60 calories. High in sugar – Our increased consumption of sugar has been implicated as being a major contributor to the skyrocketing rates of obesity observed in the Western world. 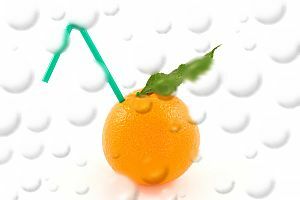 Studies have shown that children who are overweight drink 65 percent more sugary juices than children of normal weight. Some juices contain more sugar that sweetened soft drinks. Grape juice, for example, has 50 percent more sugar than Coca Cola. Bad for your teeth – One study found an 84% reduction in the hardness of tooth enamel after drinking orange juice for just five days. Researchers believe other juices may have a similar effect, as their acidity is similar. Tooth decay and cavities in children as young as two or three years old have become commonplace, and dentists point to the increased intake of fruit juice as the cause. The combination of acid and sugar is the perfect storm for tooth decay. Experts advise that children drink fruit juice no more than once a day, and instead drink milk or water. If fruit juice is taken, it can be watered down to dilute the acid concentration. By weighing these pros and cons you can decide for yourself how much juice you and your family should drink to get the benefits of drinking fruit juice while minimizing the drawbacks.